Author of Break the Wheel, ex-Google, ESPN, HubSpot, and NextView VC, and host/producer of critically-acclaimed audio documentaries about the working world. Our world is flooded by advice, ideas, and experts, but we shouldn't make decisions based on "best practices." Instead, we should do what works best for us. To build careers and companies with such clarity would lead to exceptional work, but first, we need to escape the endless cycle of stale approaches and trendy tactics that holds us back. We need to break the wheel. Jay Acunzo is waging war on conventional thinking. As a digital media strategist at Google, he was responsible for pushing marketing executives and practitioners into the digital age more rapidly, in ways that benefitted both companies and careers. He held multiple leadership positions at high-growth tech startups, including Head of Content at HubSpot, and served as Vice President of Brand and Community at the venture capital firm NextView. On the side, Jay created the award-winning podcast, Unthinkable, and co-founded Boston Content, the northeast's largest community of content creators and marketers. Courses at Harvard Business School have cited Jay's work, as well as writers at the New York Times, the Washington Post, FastCompany, Forbes, and more. He has been called a "creative savant" by Salesforce and named to the city of Boston's "50 on Fire" list. Today, Jay is the founder of Unthinkable Media, which works with fast-growing startups and challenger brands to create entertaining B2B shows. In a world where "storyteller" has become a buzzword, Jay actually understands how to tell great stories -- stories that entertain, surprise, teach, and above all, push people beyond conventional thinking so they can do their best work. His book, Break the Wheel: Question Best Practices, Hone Your Intuition, and Do Your Best Work, inspires others to do precisely that. We live in a world flooding with best practices, conventional wisdom, and trendy tactics. Every day, dozens of supposed "right" answers both internally and externally promise that they will deliver our best results. It's all we can do to simply keep up, let alone take control, get proactive, and finally do our best work. It's like we're trapped. We're stuck on this always-spinning wheel of reactive decisions and commodity work, and this wheel leads straight to the one place we don't want our companies or careers to be: average. It's time to escape this cycle. It's time to break the wheel. 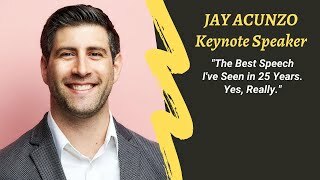 In this fast-paced, inspiring talk, award-winning documentary host and former Google and startup brand-builder Jay Acunzo will hand attendees a sledgehammer. They'll learn how to find clarity more quickly among the noise, cutting through past precedents and buzzy trends that only create sameness in their niche. Through science and story, Jay will share a framework to more successfully think for yourself when surrounded by conventional thinking. This isn't about being a rebel. It's about driving real results for companies and careers alike. In the end, attendees will become the welcome exceptions to the status quo. While everyone around them merely survives, they'll know how to thrive. Remember: Finding "best practices" isn't the goal. Finding the best approach for you is. Jay's presentation will inspire and empower people to do exactly that.